A DUBLIN CITY councillor who interrupted a radio interview with Bertie Ahern to criticise the former Taoiseach has said she did so because she was “incensed” by his “smug face”. We were there doing a press call on people’s wages at the end of the month and how they have been hit. We were just standing there when Bertie Ahern appeared with his smug face on him doing an interview about his last day in the Dail. Collins interrupted the interview Ahern was doing with RTE News to tell him that he should be ashamed of himself. “Shame on you,” she said. “Thank you,” replied Ahern. Collins said that she then had to walk away from the situation because she was so angry. Well it is, but I have to say that outside here this happens every day because people come along here to try and get themselves on TV and radio. That’s contemptuous. This is an example of people like him living in their bubble. We have to burst that bubble and I’d ask people to just go out on the 25th of February or whenever the election will be and vote. The interview with Ahern revealed that one of his biggest regrets was that the so-called Bertie Bowl had never been built. As he left the Dail where he had been a TD for 34 years, he said that he “would have loved if somebody somewhere had told me what was going on in the banks in this country but nobody ever did”. On the other hand, he said, he deeply regretted that “little countries like Qatar and Kuwait” were able to build “their ten stadiums and we never succeeded in getting one national stadium”. You can watch Bertie Ahern being interviewed on these issues and more on his last full day at the Dail on the RTE website. 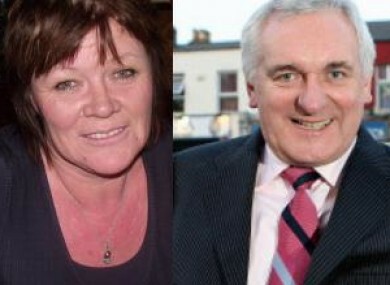 Email “I was incensed by Bertie's smug face: Councillor tackles Ahern on his last day”. Feedback on “I was incensed by Bertie's smug face: Councillor tackles Ahern on his last day”.